You'll be £12.00 closer to your next £10.00 credit when you purchase Hitler's Panzers. What's this? 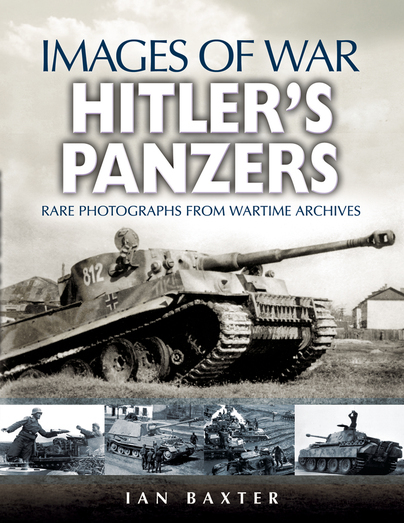 Using previously unpublished photographs, many of which have come from the albums of individuals who took part in the war, Hitler's Panzers presents a unique visual account of Germany at arms. The book analyses the development of the Panzer and shows how it became Hitler's supreme weapon. It describes how the Germans carefully built up their assault forces utilizing all available reserves and resources and making them into effective killing machine. From the Panzerkampfwagen.1 to the most powerful tank of the Second World War, the Jagdtiger, the volume depicts how these machines were adapted and up-gunned to face the ever-increasing enemy threat. Hitler's Panzers is a unique sight into the full workings of the various light tanks, main battle tanks, self-propelled assault guns and tank destroyers. It is a vivid and fully illustrated account of the development and deployment of the German tank and brings together a captivating glimpse at the cutting edge of World War Two military technology. This really is an excellent publication from Pen and Sword’s Images of War series and is therefore certain to appeal to a wide range of readers with an interest in armoured fighting vehicles. Military historians together with modellers and militaria collectors will find it invaluable as it is packed to the hilt with a wonderful collection of over 250 rare black and white photographs featuring German tanks and their crews from the Second World War period as well as a number that date back to the early 1930’s too. There are more photographs than text, but don’t let this deter you as these splendid photographs together with their accompanying text/captions are worth thousands of words and actually tell a unique story on their own, especially as they include pictures men and their machines taken during training as well as during their time on active service on many fronts during the war itself. The author has gone to great lengths in his research to find the splendid subject matter for his book, this has involved scanning official war archives as well as private collections and the result is, that he has produced a excellent value for money and invaluable publication.